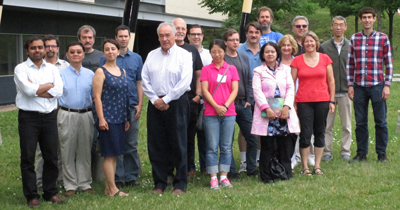 The CRM's Partial Order in Materials: Analysis, Simulations and Beyond workshop will comprise two 4-day focussed research meetings, from 21th-23rd June 2016 and 27th-30th June 2016, on partially ordered materials and complex fluids respectively, as part of the CRM thematic program on Computational Mathematics and Applications. The organizers are Dr Apala Majumdar (University of Bath, United Kingdom), Professor Stanley Alama (McMaster University), Professor Lia Bronsard (McMaster University) and Professor Alejandro Rey (McGill University). This workshop focuses on the mathematical modelling, analysis and simulations of partially ordered materials, somewhere in between the conventional solid and liquid phases of matter. Partial order is ubiquitous in nature and some key examples include liquid crystals, superconductors and complex fluids, glassy matter, colloidal suspensions, examples in the living world such as the cell cytoskeleton, bacterial suspensions and inanimate examples such as vibrated granular media. The theory and analysis of partial order not only presents cutting-edge intra-disciplinary mathematical challenges at the interfaces of partial differential equations, topology, functional analysis, calculus of variations and scientific computation but can also lead to transformative changes in materials science and nano-technology. The study of partial order in seemingly disparate fields is confronted with some common underpinning theoretical issues, which will be highlighted and discussed at the proposed workshop, examples of which include atomistic/molecular to continuum modelling, correct energy formulations and choice of constitutive relations, defects and microstructures and the mathematics and physics of self-assembly and collective behaviour. The workshop will be devided into two smaller focussed meetings on â€œGinzburg-Landau and Landau-de Gennes Theories for partial order" and â€œComplex Fluids and Applicationsâ€�. The workshop will comprise invited talks, contributed talks, poster sessions and brainstorming collaborative sessions. The organizers will advertise the meetings widely and write a workshop report, to document the key workshop outcomes and planned future follow-up activities.